One of the rules for having an effective and productive meeting is to have an agenda. A meeting without an agenda can very quickly go off topic. Like when next to climb Table Mountain in Cape Town? Every meeting you create in Google Calendar has a description section. Use that section to write up the agenda for the meeting before you send it to the attendees. To take the agenda with you to the meeting, all you have to do now is re-open the meeting in Google Calendar and you will see the option to print the meeting. 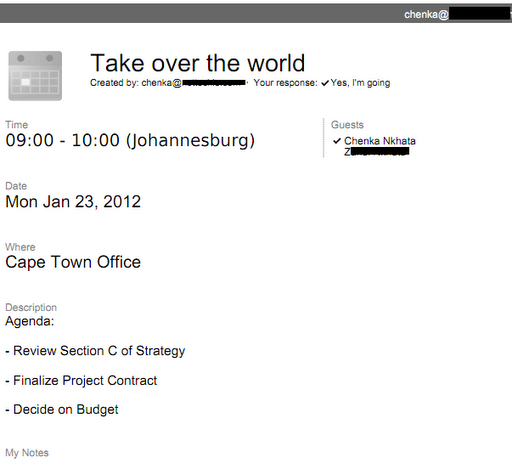 When you click the Print icon, Google Calendar will re-format the meeting into a very nice printable version. Print that and you have everything you need for the meeting (see picture above). If you don't want to print a physical copy of the agenda, then just print the meeting to PDF and put it in Google Docs where you can easily access it.